Twenty years after I first began writing publicly about Black Americans’ experiences with oppression, I didn’t think I’d still be at it. I didn’t think I’d still be writing about our collective struggle, the restoration of our full humanity, and respect for our autonomous citizenship. At least not with the same ferocity or the same lamenting heart. Yet here I am. We have so much more work to do to achieve equal rights for all. But at the heart and forefront of modern movements for social justice is one group who I believe will lead Black communities to the personal freedom and collective liberation we’ve been fighting for. We will be led by Black women. Centering the ways Black women — and in particular, Black feminist women — are fighting for Black liberation is the focus of my new book, Reclaiming Our Space: How Black Feminists Are Changing the World From the Tweets to the Streets. In fact, when it comes to the movement-building campaigns of today, one would be hard-pressed not to see a Black woman’s intellectual, emotional, and physical labor at the core. Reclaiming Our Space explores this phenomenon. Surprisingly, social media has become the most popular tool for elevating consciousness about Black feminism and for connecting the heady academia of black feminist theory to the practical, everyday lives of women all around the world. From the United States to South Africa to Great Britain and beyond, we are taking the reins and leading international movements. Black feminists have been noisy in activist circles for decades, but finally more people are listening. This impact is not limited to political and social justice activism. Huge cultural shifts have emerged from how Black women simply navigate life. From live-tweeting television shows to demanding more diverse representation in mainstream entertainment, we have become a powerful, influential demographic. Our efforts have long challenged historical narratives that exclude women’s contributions to freedom fights. More recently, though, we are creating, organizing, and amplifying our messages through Twitter, Facebook, Instagram, and the like. These platforms have become powerful tools in anti-oppression work, specifically around police brutality, sexual assault, and mass incarceration. They have provided an easy, fast, and direct way for activists to spread information to the communities and people for whom they’re advocating. For the following three movements, the effect has been remarkable. Patrisse Cullors, Opal Tometi, and Alicia Garza brought their respective experiences in activism together in 2012 to demand justice for Black people who have fallen victim to police violence and racist policing. The #BlackLivesMatter hashtag took off and functioned as a rallying cry that called for accepting Black peoples’ lives as meaningful because we are human beings who matter. Though not the first to use the hashtag, these women popularized it in a cohesive, organized way that took the world by storm. Across the United States and in several international cities, local groups formed their own BLM chapters, and people who had never engaged in any formal activism became fully engulfed in liberation work. Cullors, Tometi, and Garza have disbanded as leadership heads, yet BLM continues and the spirit continues to inspire activism around the world. The impact cannot be denied. According to Pew Research Center, from July 2013 to March 2016, the #BlackLivesMatter hashtag had been used 11.8 million times. When we consider how many impressions were made by people being exposed to those millions of tweets, it’s clear that Black women made an undeniable statement in affirmation of the value of Black lives. When Tarana Burke began using the phrase “Me Too” over a decade ago, I don’t think she could have imagined that it would transform into a movement that is now not only getting the respect it has long deserved, but that it would be embraced globally and bring about massive, tangible change for survivors of sexual harassment and assault. Burke has long been an activist and advocate for women and girls, so seeing the fruits of her life’s work enter mainstream conversations in 2017 with the Harvey Weinstein sexual harassment scandal has been incredibly refreshing. A ripple effect has led to women all around the world bravely coming forward with their own stories of sexual harassment at work, sexual assault in college, sexual violence in childhood, and more. Since then, the hashtag has sparked conversations and legislation, and companies everywhere are changing policies, while Weinstein has been indicted and others will soon find their days in court. Even more powerful is that the movement has gone global despite the fact that Black women are still less likely to be believed than White women when they say they have been victims of sexual violence and still face misogynoir in many movements that claim to be feminist in nature. There are few hashtag campaigns that have had more influence in popular culture than #BlackGirlMagic, a shortened version of #BlackGirlsAreMagic. Popularized in 2013 by CaShawn Thompson, the phrase “Black Girl Magic” can be heard in films, primetime television shows, and even the evening news. It is routinely used to describe everything from the spectacular achievements of Black girls and women in politics, entertainment, and sports to the ingenuity and culture-influencing creativity of the everyday Black woman. Thompson intended for the concept to be empowering and accessible; no Black girl or woman would be left out. Over time, “Black Girl Magic” and “Black Girls Are Magic” started popping up on merchandise. Celebrities like Willow Smith and Amandla Stenberg wore the T-shirts. Fox’s hit primetime drama Empire had its lead actress, played by Taraji P. Henson, use the phrase in her dialogue. Black women celebrities, especially, have taken to using the hashtag when posting on Instagram and celebrating their own and each other’s beauty and achievements. Now, with the words “Black Girl Magic” making magazine covers and movie trailers, it has entered the lexicon as part affirmation, part rallying cry. Black women have not only contributed to Black people’s progress, but also to women’s progress as a whole. It was Black women who marched alongside suffragettes while simultaneously fighting lynching. In the 1960s and 1970s, it was Black women who were fighting for reproductive justice while also fighting against racial injustice. Black women aren’t simply playing supportive roles in liberation movements for Black people or for women. We are at the forefront of both, functioning as architects and the most vocal mouthpieces. More of our voices are being heard and people are learning the undeniable truths about Black women. We know we aren’t literally magic. But it sure can seem like it. Feminista Jones is a Philadelphia-based social worker, feminist writer, public speaker, and community activist. She is an award-winning blogger and the author of the novel Push the Button and the poetry collection The Secret of Sugar Water. She was named one of the 100 Most Influential People in Philadelphia and one of the Top 100 Black Social Influencers by The Root. Her writing has been featured in The New York Times, The Washington Post, and Time, Essence, and Ebony magazines. 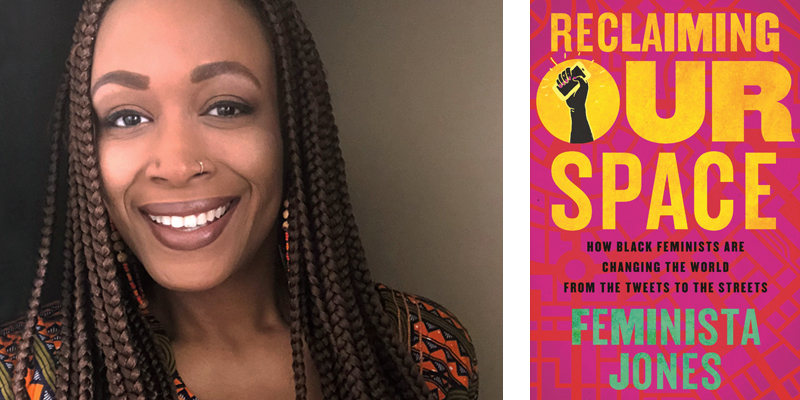 Reclaiming Our Space: How Black Feminists Are Changing the World From the Tweets to the Streets is her most recent book.